What will YOU find in our Archive? The Jefferson Public Library was founded in 1901. A $10,000 grant from the Carnegie Foundation in 1903 enabled the city to construct the existing library building. In 1967, a new addition was built to house the growing collections. Renovations completed in 1990 made the library handicapped accessible. The Galaxy Automation System, which computerized the card catalog and circulation functions of the library, was installed in 1995. In 2005, a new automation system called Polaris was installed, making the library collection accessible via the World Wide Web. The Jefferson Public Library celebrated its centennial in 2004. The following article outlining the library’s history was written by library director Jane Millard and published in the April issue of the The Jefferson Bee newspaper, Rick Morain, editor. For some time prior to the year of 1900 the subject of a public library had been discussed by the club women of Jefferson. While all felt the need of a public library, it was not until the spring of 1900 that definite steps were taken. In April 1900, Mrs. Florence Dean, President of the Culture Club, submitted a plan for holding an Art and Loan Exhibit, the proceeds to be used as the foundation of a fund for a free public library. The plan met with the approval of the Culture Club, and an invitation was sent to the Friday Club and Chautauqua Club to join them, which both accepted. The exhibit was held the first week in May and the profit was $192.03. The money was equally divided between the three clubs, as per agreement, each club preferring to keep their fund separate until they were ready to offer it to the city. During the summer, the Sorosis Club compiled and sold a Book of Quotations and earned $25 for the library fund. The Culture Club followed with a cookbook, and also held a bazaar and supper, the proceeds being $125. From a poem included in the front of the cookbook, we read: “The proceeds thereof, from the sale of these books, will go to the library fund instead of the cooks. We hope with this effort, to make it quite strong, when you see a good thing, help push it along.” One week later, the Friday Club held a book social. The public was invited and the entrance fee was a book for the library. It was a grand success with 450 books received. One of the first purchases for the collection was a set of encyclopedias, purchased with private donations from club members and their acquaintances. The public spirit and interest coupled with the readiness with which this money was donated, prompted the city solicitor to advise offering the books and funds to the city council and ask that a tax for the support of a free public library should be voted upon at the spring election. Acting on this advice, a joint meeting of the clubs was held in January 1901, and a motion was made to combine the results of their endeavors, being 950 books and $325.27 and offer them to the city for the establishment of a free public library. The council accepted and a tax was voted upon and carried at the spring election. In July 1901, the mayor appointed the first board of trustees as follows: Captain Albert Head, Dr. F.M. Dean, Dr. H.C. Kettell, Owen Lovejoy, E.B. Wilson, Henry Haag, Mrs. Dinsmore Austin, Mrs. Charles [Mary] Warrington, and Mrs. E.H. [Lulu] Barrett. Charles Bofink, city treasurer, was made treasurer of the library fund. Mrs. Maud Culbertson was elected librarian and a two mill tax was levied. Captain Head offered the use of two rooms over the Greene County State Bank, rent free for one year. The work of organizing, classifying, and cataloging the collection of books and Congressional records was completed and furniture and shelving was purchased. Jefferson’s first free public library was opened to the public December 4, 1901 at 202 East State in the theater block (above what is presently Floral Designs by Jean where Dr. Buzzard’s optometry offices were for many years). By this time even more books had been donated by the Margaret Fuller Club and private donations, so the library opened with 2,090 items. The library was open Wednesday afternoon and Saturday afternoon and evening of each week. According to the Rules and Regulations, “Any person of good deportment may use the reading rooms. All persons are required to speak in a low tone of voice.” A fine of 2c per day was charged on overdue books. 200 Jefferson residents held borrower’s cards. The library was so well patronized that in April 1902, Henry Haag, acting as a member of the library board and also of the city council wrote to steel magnate and philanthropist Mr. Andrew Carnegie asking him to donate $10,000 for a library building. In July 1902, Mrs. Ida B. Head was elected librarian and in April 1903, due to increasing patronage, it was decided to keep the library open three days a week. After a time of wondering and waiting, a reply was received from Mr. Carnegie in April 1903. Mr. Haag received a letter stating that “if the city of Jefferson would furnish a suitable site and agree to raise $1,000 per year for maintenance, Mr. Carnegie would be pleased to furnish $10,000 for the erection of a suitable library building.” In a resolution dated March 16, 1903, the city council quickly accepted the offer and, having no money with which to buy a lot, located the building in the city park. This action caused considerable dissatisfaction, the park [Russell Park] being unimproved and located three blocks from the public square. Several other sites were offered and considered. A subscription paper was circulated and $1,500 was pledged by private individuals to buy a lot one block west of the city square, known as the LeGore site, the corner lot where the library now stands. The city council accepted this site and Mr. Haag wrote to Mr. Carnegie advising him that all the conditions were met. Hallett & Rawson of Des Moines were selected as the architects, and the contract for building the new library was awarded to Allen Cook of Jefferson. The building was completed and turned over to the library trustees on April 16, 1904. The dedication ceremony was held at the Baptist Church on April 19 and the library was opened to the public that day for inspection from 4 to 10 pm. At that time, the library had a total of 2,723 books. The new building measured 3,900 square feet of space. In honor of its generous benefactor, the words “Carnegie Library – Free to the People” were inscribed above the stately columns framing the front door. The Jefferson Public Library is one of 99 libraries built in Iowa with funding support from Andrew Carnegie. The first Carnegie library in Iowa was built in 1893 in Fairfield. The first library Mr. Carnegie provided funding for was in his hometown of Dunfermline, Scotland in 1881. In total, Andrew Carnegie supported the construction of over 2,500 libraries around the world over 30 years. Born in 1835, Andrew Carnegie came to America when he was 12 years old, settling with his family in Pennsylvania. Carnegie grew to be a successful businessman and wise investor. His fortune was made in the steel industry. In 1901 he sold the Carnegie Steel Company for $480 million to J.P. Morgan, who with others, later formed the United States Steel Corporation. Carnegie believed that wealthy individuals should use their fortunes to aid society. From immigrant to businessman to philanthropist, Andrew Carnegie’s legacy changed history by providing educational opportunities to every citizen of the communities he aided. In the front yard of new library rested an elegant, three-tiered, black iron water fountain. In 1898, the Friday Club, purchased the fountain for $250 using donated funds for the intention of beautifying the town square. However, neither city nor county officials were enthusiastic about the idea and would not agree to pay for the water. So the fountain was put into storage in Bean’s barn until 1903 when the fountain was offered to the library board of trustees. The trustees accepted and the fountain was placed on the lawn just to the east of the front sidewalk. Water fell gracefully from the bowl for a few years. Over time, due to corrosion and vandalism, the fountain was turned into a flower planter. Some of the iron may have been given to the war effort in the 1940s. Gradually the beautiful fountain disappeared. In April 1929, the library’s silver anniversary was celebrated. This event was held at the Strand theatre and included a fantasy called “The Folks in Book Land Come to Life” written by Mrs. E.B. Wilson and directed by Mrs. Wilma Slininger, and a play entitled “Discords”. In April 1954, the library celebrated its golden anniversary with an open house and art show at the library on April 25, hosted by the board of trustees and members of the local women’s clubs who had been instrumental in getting the library started. Sharing in the celebration was E.B. Wilson, a patient at the Greene County hospital, who had been a member of the original board of trustees. Mr. Wilson had the distinction of serving on the library board for 46 years. By 1954, the book collection had grown to 16,000 volumes plus subscriptions to 64 magazines and newspapers. The collection also included a record player and 100 record albums. The number of items checked out was 33,283. The Jefferson Public Library became the headquarters for the Raccoon Area Libraries, a cooperative program which included libraries in Greene and surrounding counties. A large collection of books was housed in the basement of the Carnegie building for several years beginning in 1960. These books traveled between 24 cooperating libraries, with the titles rotated three times a year. Federal funds were used to help start and maintain this program, with each library also contributing a percentage of its yearly operating budget for the purchase of new books for the cooperative. A similar program called the Bi-County Library Association operated between 1979 and 1986 with Boone and Greene county libraries contributing all types of books for a quarterly rotation. Only Jefferson residents could have a borrower’s card at the library. Rural residents could use the library for a fee. In 1960, the six public libraries in Greene County contracted with the county board of supervisors to provide free library service to all rural residents of the county. This remains in effect today, with a yearly distribution of funds divided between the libraries to insure rural residents access to all Greene County libraries. Since the mid 1980s, the library has offered inter-library loan service, whereby a book not held in the local collection can be borrowed from another library anywhere in the United States via a request placed by computer. In 1966, the architecture firm of Brown, Healey and Bock of Cedar Rapids was contracted to design an addition to the original building. At the March election, Jefferson voters approved the issuance of $75,000 in bonds. An application for $89,000 in federal funds was also approved. The Wadsworth house was dismantled just to the west of the Carnegie building to make room for the new addition. Shriver Construction of Jefferson was the contractor. The new addition was completed and opened in the fall of 1967, housing the collections of the adult department. The new addition measured 4,000 square feet. At this time, renovations were made to the Carnegie building and the top floor became the home of the children’s department. In 1973, a steel sculpture was installed in front of the new addition. The sculpture was created by David Williamson of Ogden, a graduate of Jefferson high school. The name of the sculpture is “Amid a Tassel Star and the Midnight Rainbow/Costume Feathered Friends Have Rendezvoused to Ride: Twin Moons on the Tongue A Songbird’s on the Rise. Dancing Bears Announce the Wind and the Egg’s Been Left for Surprise”. The sculpture is a tribute to life in the Midwest and was commissioned by Home State Bank. It is a unique example of some of the first outdoor artwork to adorn public buildings in Iowa. The children’s library was renovated in 1987 making it more energy efficient by covering many of the windows. Other renovations included the installation of a wheelchair lift and remodeling of a patron restroom in the adult department to make the library handicapped accessible. More recent renovations have made both the front and back entrances of the library handicapped accessible. The Jefferson Public Library earned state accreditation in 1991. This distinction means that the library meets the criteria set by the State Library of Iowa in the areas of governance, administration, funding, staffing, collections, services, and facilities. These measures insure the highest quality of library service. The library must meet the standards and apply for accreditation every three years. The Friends of the Jefferson Public Library group was formally organized in 1993. The Friends function as the fundraising arm of the library. The Friends sponsor two annual fundraising events in October: a membership drive and a used book sale. Funds raised by the Friends are used to purchase items for the library over and above what is feasible in the library’s annual operating budget. Some of the items that the Friends have purchased for the library include: computers and office chairs, a glass display case, new curtains for the puppet theater, floral arrangements, slide projector, cordless telephone, FAX machine, tablecloths, 35mm camera, Christmas decorations, signage, items for the Creative Learning Center, and prizes for the Summer Reading Program. The attractiveness of the library grounds has been improved by the generous donations of the Friends through landscaping projects. The Friends have also sponsored the remodeling of the basement meeting room through the addition of ceiling fans, a sound system, small refrigerator, area rug, padded chairs, and folding tables. The library’s collection and circulation functions were automated in 1995. For this project, all the records for both the items in the collection (books, magazines, videos, cakepans, puppets, etc.) plus those for each patron had to be entered on the new Galaxy computer system. This also involved bar coding every item and issuing new library cards with bar codes. The library was closed for a week while a crew of volunteers and staff bar-coded all the books. The process of searching for a book became much faster and easier by doing a search on the computer by title, author, subject, or keyword. The new system automatically computed overdue fines, managed reserves on items, and automated many other reporting functions such as the number of items circulated by day, month, and year and the total number of patrons. The new computer system cost over $60,000 and was purchased from Gaylord Bros of Syracuse, NY. Future improvements to the system will include the capability of accessing the item catalog at home and school via the Internet, requesting renewals, placing reservations on books, and checking personal fines and item due dates. The Jefferson Public Library serves the community of Jefferson and the surrounding area. It continues to reside on its original site at the corner of Lincolnway and Vine. The historic Lincoln Highway, the main street through the business district of Jefferson, leads all citizens and visitors past this historic local landmark and architecturally beautiful building. Through the dedication of its funding bodies, trustees, librarians, Friends of the Library, volunteers, and most importantly its patrons, this local treasure continues to be maintained. The library is governed by a five-member board of trustees. Trustees set the policies that guide the operation of the library, oversee the annual budget, and approve expenditures. The current board of trustees includes: Gary Haupert (president), Jim Copeland (secretary), Rosemary Hagedorn, John Beltz and Doris Squires. 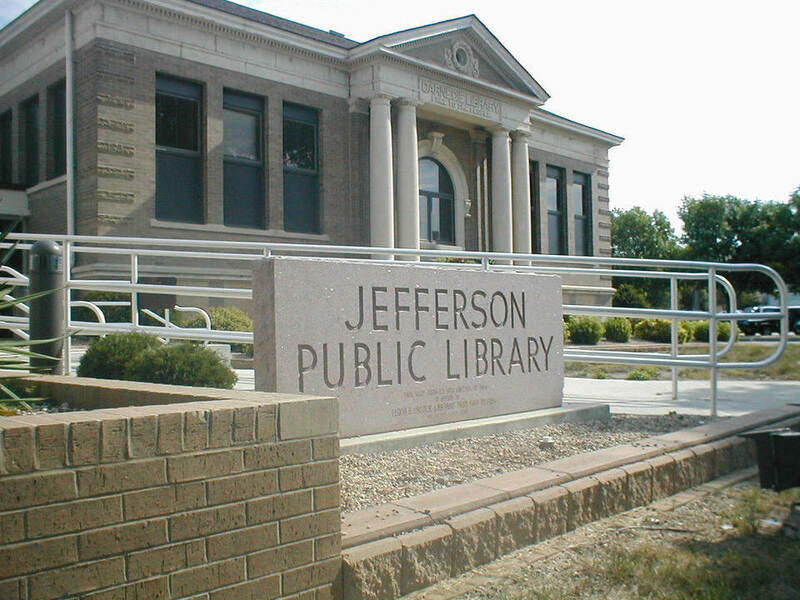 The Jefferson Public Library is funded by the City of Jefferson, Greene County, the State of Iowa, federal government, and donations from local businesses, community groups, and private individuals. A very active children’s and youth department provides ongoing programs and services for infants through sixth grade. The annual summer reading program encourages youth to practice and improve their reading skills throughout the months between grade levels. The Creative Learning Center which opened in 2000 provides children with hands-on learning experiences through creative and educational games and activities. The storybook cottage, a child-size house made possible by the Jefferson Rotary Club and Beta Tau Delta, is a quiet place for children to read. The guest reader program which began in 2001 invites school classes to visit the library and enjoy a story read to them by a volunteer from the community, with special time allowed in the Creative Learning Center before the library opens to the public each day. Every November during National Children’s Book Week, elementary school classes visit the library to enjoy a puppet show which focuses on the importance of reading. Every Tuesday morning, storytime is held for 3-4 year olds, which includes reading a story and a related craft activity. A variety of other programs and activities are offered every month. National Library Week is celebrated every April with themed activities for all ages. A cooperative agreement between the Greene County Genealogical Society Genealogy and the Jefferson Public Library in 1988 resulted in housing the GCGS collection of reference materials in a room in the library basement. Staffed by GCGS volunteers, the reference library is open two days a week for those interested in researching their family history in Greene County. GCGS has indexed county courthouse records such as births, marriages and deaths, as well as cemetery records, and newspaper obituaries. Volunteers assist researchers in learning the basics of family history research using local records and computer databases. A genealogy reference section may also be found in the adult department which contains microfilm of the Jefferson newspapers from 1871 to the present and the Greene County census on microfilm since 1856. The Jefferson Public Library offers 8 public access computers. Four computers in the children’s department offer educational games and programs. Four computers in the adult department provide internet access (added in 1997), word processing, graphics, presentation, photo editing, spreadsheet and database software. Two of these computers were acquired in 2003 with a grant from the Bill and Melinda Gates Foundation. A few more of the library’s many services available for its patrons include a bookdrop on the west side of the library, public meeting room, weekly GED classes, and home delivery service of books and other items for those patrons physically unable to come to the library. While the largest collection in the library continues to be books, several other items have been added to the collection over the years. Books make up over 32,000 items in the current collection, while the total number of items in the collection is over 44,000. Other items include: movies on video & DVD, magazines, newspapers, puppets, games, puzzles, cakepans, large print books, books on tape and CD, and media equipment. In 1963, the library began to purchase art prints that could be checked out for enjoyment at home or in the office. These art prints were often reproductions of famous art works. Art prints continue to be part of the circulating collection including landscape, still life, portrait, and seasonal artwork. Many special events and activities have been planned to celebrate the library’s centennial throughout the year 2004. In January, a banner was unveiled by Mayor Todd Madson, and members of the Board of Trustees. John Witt, author of the book Carnegie Libraries of Iowa, presented a program in the afternoon, library director Jane Millard presented the history of the Jefferson Public Library, and the Friends of the Library hosted an open house. Each month, programs for all ages will be offered focusing on local history or the 1904 era. The centennial will be celebrated during National Library Week in April. “Centennial in the Park” will be held Saturday, April 24 from 1-4 pm in Russell Park. Birthday cake and homemade ice cream will be served, and balloons will be handed out to each child in attendance. The entertainment will include horse and wagon rides, pioneer games such as panning for gold, bobbing for apples, shooting marbles, a 3-legged race, a storyteller, and a barbershop quartet. The Jefferson Public Library will be open on Saturday, June 12 from 1-5 pm in observance of the Bell Tower Festival. The library will also have entries in the Bell Tower parade and a program in the afternoon will feature artist David Williamson of Ogden, who created the sculpture in front of the library. Commemorative items will be sold by the Friends of the Library throughout the year. A lasting remembrance of the centennial will be a quilt, specially designed and sewn by local quilters, which will be on display in the library. A large sign in the front yard with a brick pathway leading up to it will be installed later in the year in commemoration of the centennial. Current library staff includes: Linda Cherryholmes, Cindy Bauer, and Megan Vaughan, (adult department), Tina Nelson and Carrie Boude (children’s department), Janet Owens, Jan Lane, Judy Mohler, and Glennie Sayre (substitute library assistants). 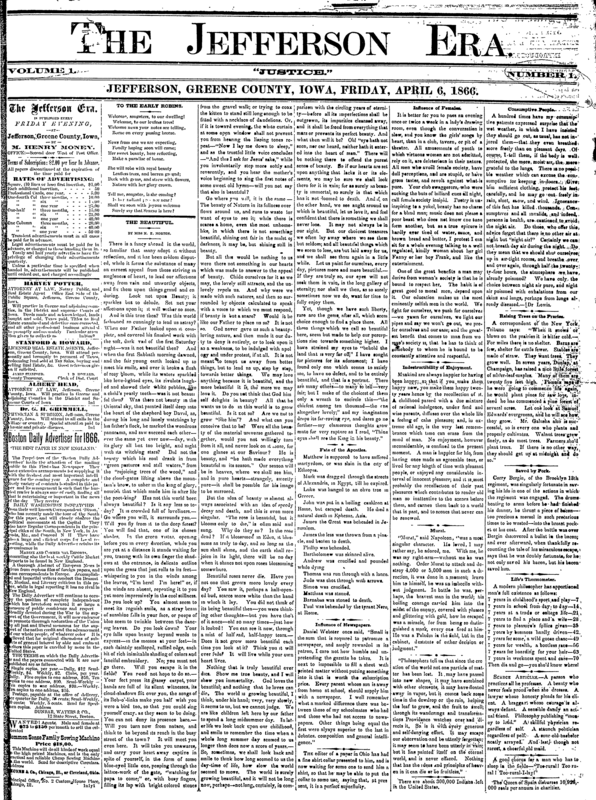 Numerous articles printed in Jefferson newspapers since the late 1800s including the Souvenir, Bee and Herald. Library records & statistics, and board minutes.